On Monday 29th Feb Edinburgh Claimants provided an accompanier for a claimant who had come to us for support after being intimidated and bullied during interviews at High Riggs Jobcentre. Past experience at High Riggs where staff (up to management level) have attempted to obstruct claimants being accompanied by making up arbitary rules, such as that accompaniers need to show ID, led Edinburgh Coalition Against Poverty to hold a leafletting session outside in case solidarity was required. When the claimant and his accompanier attempted to enter, four G4S security guards blocked the way, physically separated the claimant from his accompanier and asserted that the claimant had no right to be accompanied. The four volunteers leafletting came to the door to insist on the claimants rights and were physically assaulted and menaced by the security guards. This is the latest in a catalogue of bullying, harrassment and denial of rights at High Riggs stretching back over the last two years. It is vital that we don’t let them get away with this any longer. The same claimant is being accompanied by the same volunteer at the next signing date on MONDAY 14TH MARCH. 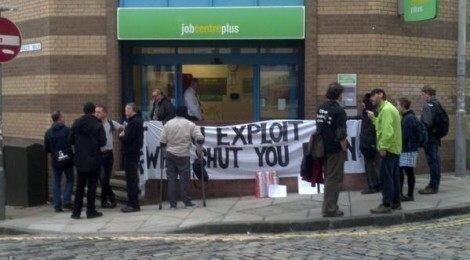 EDINBURGH COALITION AGAINST POVERTY ARE THEREFORE CALLING FOR A LARGE SCALE SOLIDARITY ACTION AT HIGH RIGGS JOBCENTRE ON MONDAY 14TH MARCH AT 3PM. THE RIGHT TO BE ACCOMPANIED AT APPOINTMENTS IS FUNDAMENTAL IN PROTECTING CLAIMANTS FROM ISOLATION AND BULLYING. PLEASE COME ALONG TO HELP ASSERT THIS RIGHT.